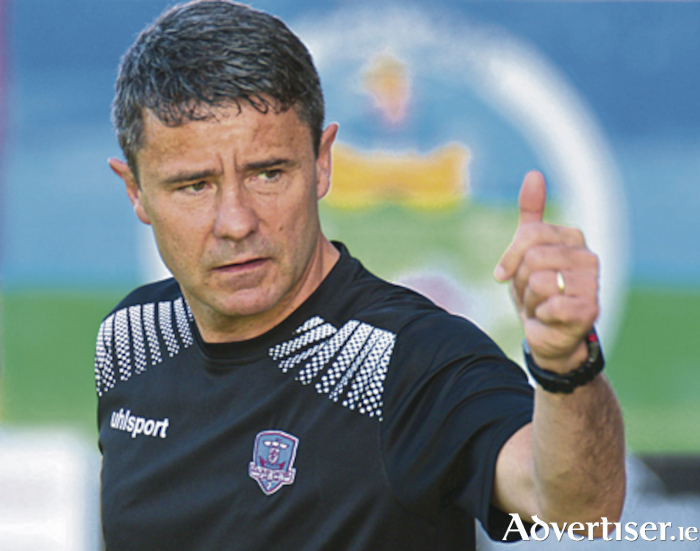 Galway United will be eager to deliver a much improved performance for new manager Alan Murphy in tomorrow's SSE Airtricity League first division encounter against Athlone Town at Eamonn Deacy Park. United's record league goalscorer Murphy, who made a welcome return to playing duty with the club in February, takes charge of the Tribesmen for the remainder of the season. It is a boost for United, who have struggled in recent weeks, losing four and drawing two of their last half dozen matches. That poor run means United are now six points off the play-off positions in the table, but Murphy, who will be assisted by the highly-regarded Mark Herrick, still believes the team can finish the campaign strongly. "Looking at it in the short term this season, I still have ambitions," Murphy says. "We have nine games left and we have to look at those nine games to see what we can get from them and what kind of pressure we can put on the teams above us." Currently sidelined with a rib injury, Murphy met with club officials following Friday's bitterly disappointing 2-1 loss against Shelbourne at the Dyke Road venue. "It was a very busy weekend," Murphy says. "It was a very poor performance on Friday night and after that I was contacted, the board asked me to meet to discuss where we can go from here, and whether I would be available to try to steer the ship for the foreseeable future. There was only one answer to that: yes. "It is a club I started with when I was 16, and obviously there has been coming and going, but Galway United I kept coming back to." Murphy, who will continue to manage the United U17 outfit, is adamant about the promise that exists in the west. "We have a lot of talent between the U17s and 19s," Murphy says. "The talent needs exposure and a chance to see whether they are going to be able to cut it at the level. Maybe this is the stage when a group of underage players needs to step up to take an opportunity. We all made our debuts at some stage, I would have no fear in playing the younger group." Mark Herrick's return to the United coaching staff is a real plus, according to Murphy. "I have known Mark Herrick since I was 16 or 17 when I first played against him when he was playing for Cork," Murphy says. "As I said to the players on Tuesday morning when I introduced him, this is somebody who has an awful lot of the characteristics that I'm proud of in my own self. He is determined, a winner, a strong character, he calls it as it is, and is hard working. "He is an excellent coach on the training pitch, it was an absolute no brainer for me. The first minute the board asked me to take the role, he was the first person I thought of. "There was no better person to come in with me to put my views to. May be he will knock them down at times and he would challenge me. He is absolutely integral to me taking it." With the July transfer window open Murphy, who is keen to make some signings, expects a turnover in players in the coming weeks. "There will have to be a bit of movement in and out," Murphy acknowledges. "Change is needed and we have to get fresh faces in. Unfortunately to get fresh faces in, faces will have to disappear, that is just a budget thing. "It is nearly one in, one out, because the budget is so tight and there isn't a lot to play with, that is just the way it works. We will be looking for loan deals and looking for people with things to prove. This season I came back and the money side of it didn't matter to me, I played for nothing. "Maybe a type of player like that where it means something to the player to come back to try to put the shoulder to the wheel for nine games to see what they can do, to see where it takes the team and the club."